The New York State Office of Temporary and Disability Assistance releases a monthly report comparing their ‘Welfare” data for the same month (in this case January) over the last three years. The chart below is in the latest report. The report can be found at the OTDA website. The first three columns reports the number of cases and recipients (first number) for each year. (The first number is cases–the second number is recipients.) The last three columns compare the expenditures over the three year period.Although the trend is that the number of cases, recipients, and the costs generally increase, Chemung actually decreased from 2011-2013! For some counties the increase was small, but Yates (my home county), and Seneca counties the expenditures doubled in the three years–the number of cases almost doubled and the recipients increased by about 75%. This chart is the third in a series (and last one for now) that looks at the lower end of the NY 23rd financial picture. The first one focused on Poverty in the district. The second one was about SNAP (aka Food Stamps). There are other ways to measure the financial need for our residents–medicare data, medicaid data, school’s free lunch, food banks, to name a few. I will be working on locating and report as much data as I can find that will help to give us a clear picture of our communities. There is no doubt our district needs to encourage industry and businesses to locate here. You hear it from the congressional leaders all the time, but then they don’t act. Our Congressman has recently bragged that he voted to take the flexibility out of the Welfare To Work portion of the Welfare Program. Progress? I don’t think so. This entry was posted in Constituents, Economics and tagged NY 23rd Counties, Welfare costs, Welfare Data. Bookmark the permalink. 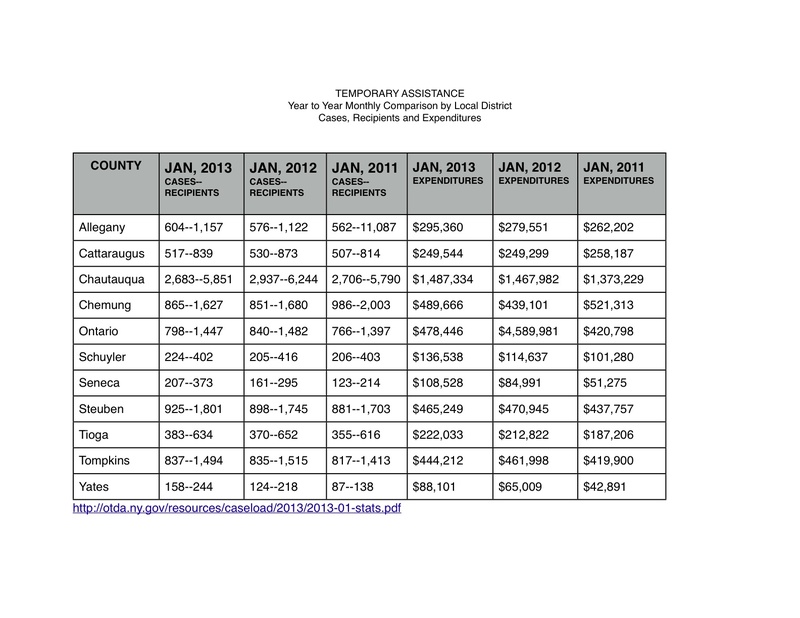 This is temporary assistance, so the number of cases may have declined in Chemung County because people have exhausted their benefits.